Like it or not, we often do judge books (and games, and other things) by their covers, and their interiors, and by their looks in general. Even the “retro” style game products that deliberately try to look like they were assembled on somebody’s typewriter or paste-up board and mimeographed are going for a specific look, recreating a particular style. Art and design have come a long way in the gaming hobby, and have tremendous, if sometimes unsung, influence on our products. I wanted to be an artist once. I could draw reasonably well when I was a kid, but I didn’t really have the passion for art that it takes to be a professional artist, whereas I was able to turn my passion for writing things for the games I loved into a living. Still, having some small experience with the artistic process, I have a great appreciation for the work of artists, whose names are not as often associated with the games and worlds they help to create. After all, I’m willing to bet some of your fondest memories about your favorite games involve iconic pieces of art from those games—I know mine do. We Ronin Round Table authors are pretty much all writers, however. Makes sense, given this is a column, and there are a lot more of us than there are artists in the company. In fact, only one guy on-staff is responsible for the artwork and the look of our books. That’s Hal Mangold, Green Ronin’s Production Manager, which means he’s layout designer, art director, and print buyer all in one. We have four developers to manage our game lines (Mutants & Masterminds/DC Adventures, Dragon Age, Song of Ice & Fire Roleplaying, and Freeport/Pathfinder) and one guy who takes all of the materials from those lines and turns them into finished products, with the able assistance of Marc Schmalz, our e-publishing manager. Small wonder he’s not writing too many online columns! I’ll let you in on a little secret, too. For me, the art creation process for a book or game is a lot like exercise: I often hate going through the process (even starting the process), but really appreciate the results that make it all worth it. When they say “a picture is worth a thousand words,” they’re not kidding, because sometimes it feels like it takes a thousand words of description, detail, and references to convey those pictures we writer-types have in our heads that artists so remarkably turn into reality. We go through the process of writing and providing notes and guidelines and specifications for artwork, hoping we’ve explained things clearly enough. Sometimes, we don’t, and that’s usually on us when a sketch comes back and we’re, “That’s not quite what I had in mind…” or “If we could just change a few things…” and the patient, professional artists go literally back to the drawing board (or tablet) and make it happen. More often than not, their efforts exceed expectations. When I worked with Dan Houser and Daniel Solis on the Assembled Edition of Icons Superpowered Roleplaying, for example, I described the concept for the cover: an homage to Giant-Sized X-Men #1, combining original iconic heroes with some of the new ones we created for the cover of Great Power. 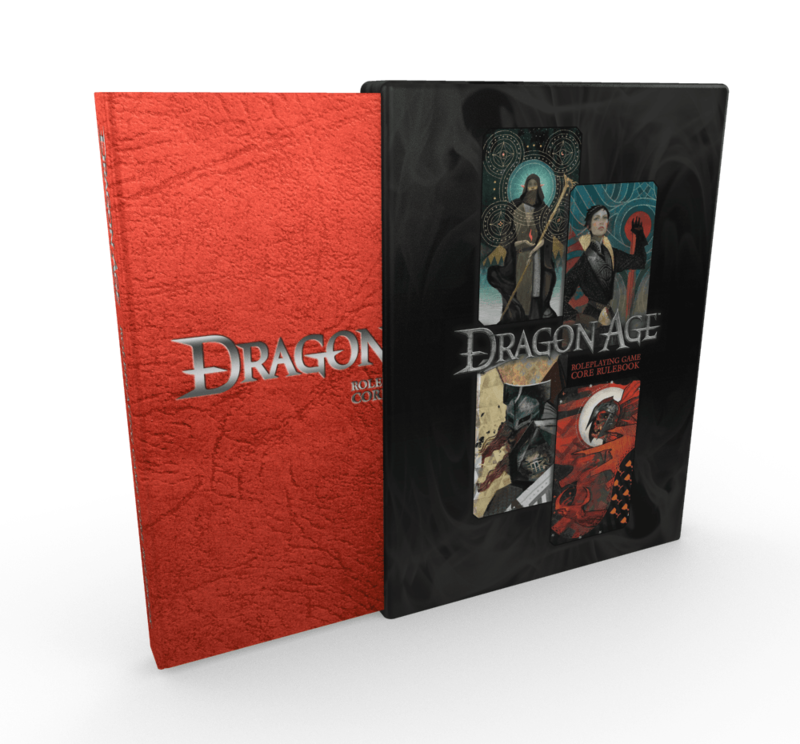 Continuity with the previous edition of the core book, but also a new, fresher look. What Dan and Daniel came back with turned out far better than the picture in my head (and the crude sketches and compositions I provided) and really fired my enthusiasm for getting the book finished. Indeed, the phase of production when sketches and concept art begins rolling in can really help to fuel the final push to pull the rest of the product together, in my experience. More importantly, art so often has a powerful role in defining the feel of a game. The Blue Rose Romantic Fantasy RPG from Green Ronin would be a totally different game without Stephanie Pui-Min Law’s gorgeous covers and inspirational artwork, which drove elements of the design. Likewise, Hal made a deliberate effort for that game to engage as many female artists as possible to give the book a particular look and style beyond just our literary source material. The Michael Kormak and Slawomir Maniak covers for A Song of Ice & Fire Roleplaying and its Night’s Watch sourcebook, on the other hand, capture a whole different type of fantasy gaming, bringing the savage realities of Westeros to life. I’ve lost count of the diverse, talented artists I’ve had the privilege to work with on Mutants & Masterminds, a game based on a genre itself drive by artwork: that of the comic books. Seeing character concepts for Threat Report spring to life from the drawing boards of the likes of Sean Izaakse, Anthony Castrillo, and Alberto Foche made those characters real for me in ways that just writing about them did not. Freedom City would not be the setting it is now without the defining work of Ramon Perez in bringing its diverse cast of heroes and villains to brilliant full-color existence. I could go on and on, but I’m running out of space if I want this Round Table to be the equivalent of just one of the beautiful illustrations gracing the pages of our books. It truly does take a lot of words to paint a picture as detailed as some of those you’ll find in the best-looking games and books in our hobby. If you don’t already, the next time you pick up a new product (or look through one of your old favorites) glance over the credits for the artists as well as the designers and authors and consider the impact they’ve had producing something that brings our imagination to life in such a visual way. They may not be writing about it, but they’ve still got thousands and thousands of their own “words” in there.